China's President Xi Jinping and Philippine President Rodrigo Duterte toast during a State Banquet at the Malacanang presidential palace in Manila, Philippines, Nov. 20, 2018. A maritime energy exploration agreement is being seen by some as an attempt to continue improving relations between China and the Philippines, countries once so opposed that their rift over maritime sovereignty went to a world arbitration court. Over the past two years, China has extended economic aid to the relatively poor Philippines. Philippine President Rodrigo Duterte in turn set aside the sovereignty dispute, saying there’s no way his country could win a war with China. “Joint exploration demonstrates at least superficially on the Chinese side that they are trying to engage in diplomacy and to build bilateral relations through various kinds of joint activities, so I think that’s a win for China diplomatically,” said Stephen Nagy, senior associate politics and international studies professor at International Christian University in Tokyo. 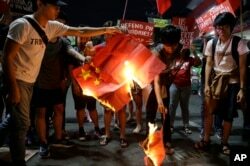 Students burn a Chinese flag as they protest against the visit of Chinese President Xi Jinping during a demonstration outside the Presidential Palace in Manila, Philippines, Nov. 20, 2018. The two countries inked their exploration pact as one of 29 agreements signed during a state visit to the Philippines by Chinese President Xi Jinping. It calls for establishing a joint steering committee as well as at least one working group with representatives from each side’s major oil drillers. The committee will negotiate more precise deals on where to look for fuel. The memorandum does not specify where the two sides would explore — some locations are more sensitive than others — or who would take how much of any fuel discovered. 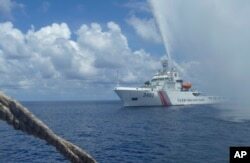 FILE - A Chinese Coast Guard boat approaches a Filipino fishing vessel off Scarborough Shoal in the South China Sea, Sept. 23, 2015. “I think this is one way of signaling that China is willing to be a different kind of aid giver,” said Alan Chong, associate professor at the S. Rajaratnam School of International Studies in Singapore. Today many Filipinos — more accustomed to strong Manila-Washington relations — remain leery of tie-ups with a country that disputes sovereignty with their own. Some wonder too whether Beijing’s billions of dollars in of economic aid pledges over the past two years will materialize or, conversely, leave their country indebted to China. Oil exploration has been “politicized,” said Christian de Guzman, vice president and senior credit officer with Moody’s in Singapore. But he expects state-to-state ties will improve anyway through Duterte’s term into 2022. “It is quite clear that for the duration of the Duterte administration that the tensions vis-a-vis China have eased,” he said. 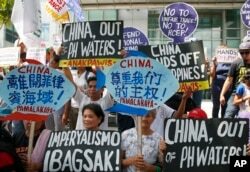 FILE - Protesters display placards during a rally at the Chinese Consulate to protest China's artificial island-building at the disputed islands, reefs and shoals off South China Sea, June 12, 2017 at the financial district of Makati city, east of Manila, Philippines.